1. Our General Terms and Conditions of Sale (GTCs) are considered agreed upon issue of an order at the latest. Deviating conditions of the orderer do not apply, even if we do not expressly object to them. Agreements reached orally are effective only if they are confirmed immediately in writing by at least one party and the other party does not object to them immediately. 2. Quotation documents, data, figures, dimension information and weight information are not binding. All documents remain our property. They may neither be made accessible to third parties or used for another requirement without our written consent. 3. Should version changes or additions become necessary as an effect of amended regulations, implementing regulations or official stipulations or of a changed state of the art that necessitate an additional delivery or a change to the agreed scope of delivery after the date of the order confirmation up to the delivery and/or handover of our scope of delivery and/or supply, these costs will be at the orderer’s expense. The parties are obligated, in this case, to make adjustments to dates and/or warranties. 4. For planning purposes, intermediate dates are indicated as accurately as possible; however, they are not binding. Contractually binding dates are, in the case of pure delivery contracts, exclusively the delivery date, and in the case of contracts in which assembly and/or commissioning services are additionally owed, the agreed conclusion date for the final service. Events outside our control, such as force majeure, a disruption in operations, non-delivery on the part of our sub-suppliers not caused by us as well as a credibly shown, non-culpable proved rejection of an important workpiece extend the delivery period according to the duration of the hindrance. 5. The orderer shall pay, unless otherwise agreed, 1/3 of the order value by 30 days after the order at the latest, 1/3 once half of the fulfilment period has ended, 1/3 after delivery, or, should further services such as assembly, commissioning, trial operation or proof of performance be owed subsequently, after the fulfilment of the last service owed, net, plus value added tax, without any deduction. 6. A right of detention or right of set-off of the orderer exists only in the event of counterclaims of the orderer that are recognised by us or that are legally established. 7. Unless otherwise agreed, delivery ex works is considered as agreed. Even if non-fright delivery is agreed, the delivery takes place at the orderer’s risk. 8. If, for reasons for which we are not responsible, the good is not accepted on the agreed delivery date, the day on which we gave notice of our readiness to deliver is considered the day of delivery. On this day, the payment due for the day of delivery also becomes due. Should any services of ours following the delivery be unable to take place on the contractually agreed dates for reasons for which we are not responsible, the follow-up rates also become due on the contractually agreed date. Should the value of the payments exceed the value of the deliveries and/or services performed by us by more than 10% of the order value, we are, at the orderer’s request, obligated to furnish security. If damage is incurred to the buyer due to a delay for which we are responsible, we shall provide compensation for the demonstrably occurred damage, but only in the amount of 0.5% per week of the purchase price corresponding to the part of the delivery affected by the delay in delivery, and as a maximum 5% of the purchase price corresponding to the part of the delivery affected by the delay in delivery. However, this does not apply if liability is assumed on a mandatory basis in cases of intent or gross negligence or due to injury to life, limb or health. A change to the burden of proof to the disadvantage of the buyer is not connected with this. 9. 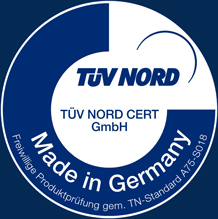 We provide 2 (two) years’ warranty for the quality of the material and correct performance from the day of acceptance onwards as long as we either rectify all the parts that demonstrably are or become defective due to poor materials or erroneous design or deliver new ones ex works without assembly and commissioning, according to our choice. Should even repeated rectification be unsuccessful, the orderer has exclusively the right of abatement; a withdrawal of the orderer is ruled out. The supplier assumes no warranty for wear parts. Wear parts are such parts that usually are replaced or ought to be replaced within max. 12 months after use. 11. All delivered goods remain our property until the complete fulfilment of all the requirements from the underlying contract (goods subject to retention of title). The treating and processing and the mixing of the goods subject to retention of title takes place for us as the manufacturer. In the event of processing, combination and mixing of the goods subject to retention of title with other goods by the orderer, we are entitled to co-ownership of the new good. The orderer may sell the goods subject to retention of title only in the ordinary course of business. In the event of sale of the goods subject to retention of title as well as of termination of our ownership of the goods subject to retention of title due to processing, combination and mixing, the claims of the orderer from the underlying transaction are considered as ceded to us already at this point up to the level of the value of our property. We have the right to disclose the cession and to collect the accounts receivable at any time. 12. We are not liable towards the orderer – for any legal or contractual legal reason whatsoever – for consequential damage of any kind, for example production downtime, lost profit, etc., with the exception of the cases of grossly negligent or intentional cause of damage. 13. The place of fulfilment for the payment obligations of the orderer and the place of jurisdiction for both parties is Köthen. German law under exclusion of UN purchasing law applies to all possible disputes from or in connection with this contract and its execution. 14. All collaborative actions of the orderer required in our fulfilment of the contract constitute contractual obligations. 15. Should an item or even just one sentence of one of the items (including this one) be ineffective, this does not affect the effectiveness of the rest of the sentences of this item or other items. The partners are obligated to replace the ineffective clause with an effective clause that comes closest to the financial purpose of the ineffective clause.